This post has been updated. Please click here to read the newer post. 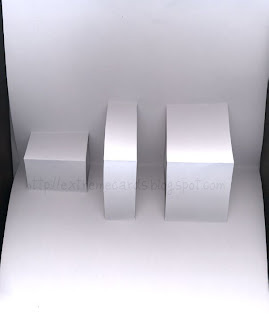 While simple to construct, the pop up card box is extremely versatile. It lends itself beautifully to cards with strong graphical elements. The pop up mechanism enhances the graphics without being distracting. 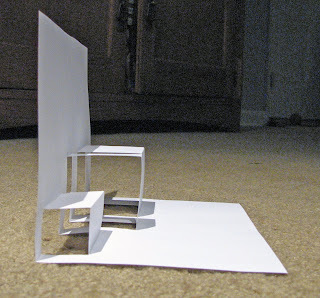 Today's Lesson: A pop up box symmetrically cut from the fold. Fold your paper in half. I like to use a whole sheet of 8.5" x 11" when I'm learning a new technique. 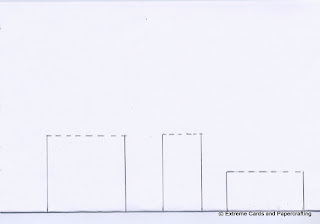 On the outside of the folded card, draw one or more rectangles of any size, where one side of the rectangle is the fold. Here I have drawn three of various size. DO NOT CUT across the top. Score across the top of the rectangle. (Shown as dotted line on the sample.) You now have a flap of paper with a fold across the bottom. Set creases into the rectangle by folding the flap up, then unfolding. Flip the card over and fold the flap up on the other side, then unfold. Open the card. From the back, push the square to pop it forward. It should look like this. Your graphics can be affixed to the front or top of the pop up steps. 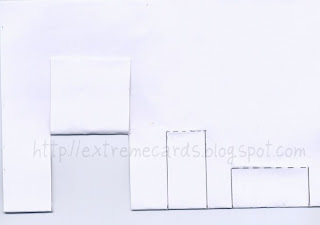 Before gluing everything together be sure nothing will stick out from the edges of the card when it is folded. 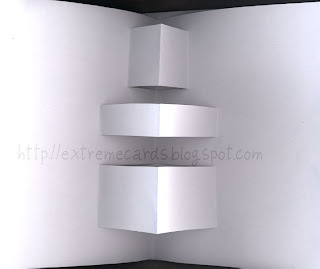 You can create vastly different designs just by varying the size and placement of the pop up rectangles. Turning the card to open from the side instead of the front presents additional possibilities.